North Jakarta Administration is holding a socialization of sustainable development. It was held in the North Jakarta Mayor's Office's pattern room and attended by dozens of participants representing urban village, sub-district, UKPD and public figures.
" This is an effort to create a better North Jakarta. 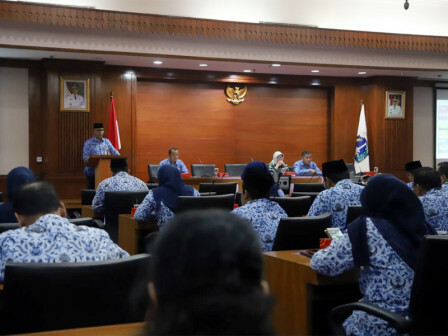 City without poverty, without hunger, healthy living and prosperous city"
North Jakarta City Secretary, Desi Putra stated that it aims to give an understanding of sustainable development, overview and action plan for the next five years to the community. Hopefully, it will be input for the North Jakarta to improve the quality of planning. "This is an effort to create a better North Jakarta. City without poverty, without hunger, healthy living and prosperous city," she expressed, Monday (10/29). To realize a better city, there must be a good planning. Hence, the planning stage must be carefully prepared. The Sustainable Development Goals (TPB), she continued, is a global development agenda that perfects the MDGs. "TPB doesn't only contain objectives but also includes ways to implement or ensure the achievement of all objectives," she uttered.